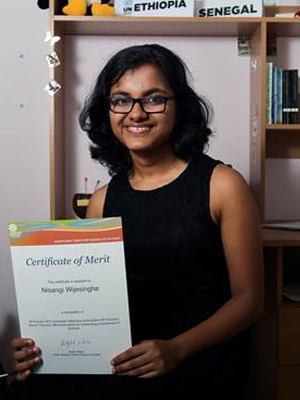 Darwin High School graduate Nisangi Wijesinghe claimed an impressive array of NT BOS awards, including the Australian Veterinary Association (NT Division) Dennis Thomson Memorial Science Award. Named one of the top twenty NTCET completers, the 18-year-old high achiever was lauded as the Most Outstanding Stage 2 NTCET Student of 2017, collected a certificate of merit in four subjects, and with an ATAR of 99.8, was presented with a Charles Darwin University Top Ten Australian Tertiary Admission Rank Award. To sustain her equilibrium during Year 12, Nisangi always sought to stay in control of herself, and importantly, sustain her health. “I try to stay calm and not get stressed – staying in control is important,” she said. “I made sure that I looked after myself, getting enough sleep and nutrition to make sure I could wake up ready for each day, and that I could be the best I could be. “A healthy body is necessary to have a really positive and productive mindset, and it helped me approach everything with a creative mentality. Nisangi will begin studying medicine at Monash University this year.